If I had decided to write a blog called ThreeWordBirds or FourWordBirds, I would have literally thousands of birds to choose from. There’s even a hefty selection of FiveWordBirds available. But if this blog were called SixWordBirds, it would be very short indeed. Among the 10,500 (or so) living bird species, only one bears the blessing (or curse) of a six-word name. Its unusual moniker is a bit of a meaningless anachronism, to be honest, but there’s no doubt that the King-of-Saxony Bird-of-Paradise deserves as much distinction as it can get. Artist’s rendering. No exaggeration used or needed. If – like me – you are not too concerned about historical geography and politics, you may now find yourself googling Saxony and instantly regretting it as you hopelessly skim its Wikipedia entry. Apparently there is much to learn about it, but at the very least it seems to me that Saxony is a present-day German state which was once a kingdom (among many other things) and thus had a series of kings. One of those kings was King Albert of Saxony, whose reign is described by Wikipedia as “largely uneventful.” It is this King of Saxony, nonetheless, after which the King-of-Saxony Bird-of-Paradise is named. Incidentally King Albert’s wife Queen Carola was also honoured with a bird name – the Carola’s Parotia, sometimes referred to as the Queen Carola’s Six-wired Bird-of-Paradise. Were it official, that would be the world’s only seven-word bird name, and I would be writing a different post right now. But I digress. As usual. 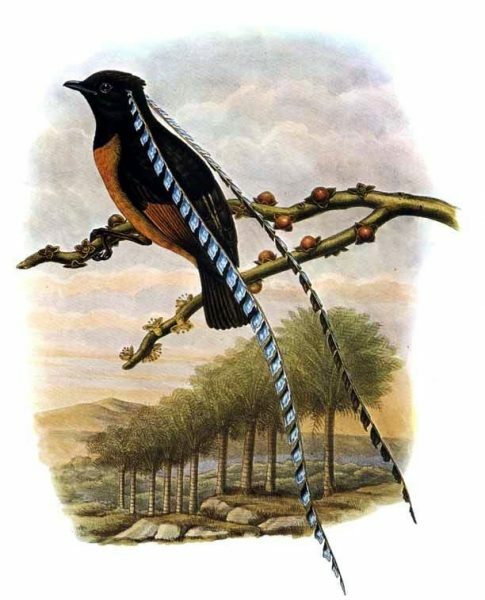 The King-of-Saxony Bird-of-Paradise’s name does not give us any clues about the bird itself, as it was chosen by the bird’s German discoverer simply to honour the then-king. The bird and the man are not without common ground though, as both possess unusually long names. You may call him King Albert, but his mother called him Frederick Augustus Albert Anton Ferdinand Joseph Karl Maria Baptist Nepomuk Wilhelm Xaver Georg Fidelis. I can only assume she used all twelve of his middle names when she was angry. At this point in the post I would often describe the bird to you, but a picture really is worth a thousand words and there’s only one part of this bird worth discussing anyway. No, it’s not his “brownish-grey legs” (thanks Wikipedia), but rather the “two remarkably long…scalloped, enamel-blue brow-plumes that can be independently erected at the bird’s will.” In short, there are some weird things sticking out of his head, and wait till you see what he can do with them. Like many birds-of-paradise the King-of-Saxony has an elaborate, and frankly odd, mating display. In it, the male erects his unusual head feathers and flails them about. He then puffs out all his other feathers, vibrates his wings, does a frenetic little dance, and emits a terrifying series of mechanical clicks, whirrs and rattles. The female, naturally turned on by this maniacal display, instantly agrees to copulation (I assume). Amazingly, the King-of-Saxony may not even be the most ridiculous among the birds-of-paradise, and competition would be stiff if we were tasked with choosing a winner. For those of us currently a little short on funds to take a trip to Papua New Guinea, the incredible Birds of Paradise Project provides a glimpse into this spectacular family. If you prefer your nature narrated by a kindly British voice (like I do), consider checking Attenborough in Paradise out of your local library. Incidentally, the crew of Attenborough in Paradise was the first to film the King-of-Saxony’s mating ritual (the bird, not the person). 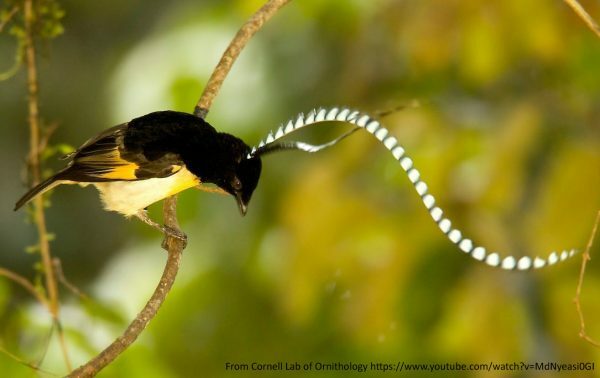 So there you have it – the world’s only six-word-bird, the King-of-Saxony Bird-of-Paradise. Long may he reign.